How are Tech Managers Responding to Google Glass & Other Wearables? Everything is perennially “new” in the world of technology. But the emerging category of “wearables,” such as Google Glass, Samsung Gear VR, Oculus, and Apple’s Smartwatch, have blazed a path toward furthering the parameters of 21st Century thinking and the IoT (Internet of Things). As wearables gain market acceptance, technology managers on campus want to know when—and in what wearble—to invest. What will be obsolete? How should ROI be reframed? The education world has seen its share of technological advancements, so much so that such developments have catapulted certain institutions, e.g., Harvard, to the forefront of market recognition. Similarly, technologies and applied concepts—such as MOOCs, cloud, virtualization, and Bring Your Own Device (BYOD)—have made the higher education space more akin to corporate and enterprise vertical industries than ever before. The way some institutions have leveraged emerging technologies puts them a cut above other vertical markets. Most market-leading manufacturers are taking a measured approach to introducing equipment at the “right time” to satisfy the expectations of tech-savvy end-users. The Google Glass Explorer trials are one small example of this. The Ivy League and major universities usually grab the spotlight for their expansive technology developments. They are not, however, the only ones pushing the emerging technology envelope. Google Glass, in particular, has a uniquely democratizing nature. Colleges and universities that may not be as large or notable are fast-becoming education technology innovators. In some respects, smaller institutions, such as Point Park University in Pittsburgh, PA, have begun to blaze a path for those of major notoriety. Stephen diFilipo, a technology strategist and thought-leader in higher education, who also happens to be expert in BYOD policy, is known for his work with advanced wearable technologies. diFilipo considers Google Glass to be a game-changing technology in the higher education space. “The emerging category fits into wearables and I think [Google Glass] is a high-end wearable, because of its ability to capture still imagery and video,” he explained. Though this category is a moving target, diFilip believes that it is critical to understand exactly how end-users could be affected when considering a potential purchase, management strategies, and upkeep. Ball State University is one of the larger higher ed institutions that diFilipo finds notable. He referred to a gentleman out of Ball State University, Kyle Parker, a Sr. Software Engineer for Developing Technologies. Parker has been a strong influence in the usage of Glass, as well as other high-end technologies on campus. Parker continued, “At Ball State, we have purchased several pair of Glass and distributed them to computer science professors, a student, and technology staff—all in the hopes of finding that perfect union of technology and education. We want to get faculty and students excited about the possibilities the technology can offer, and find creative ways to incorporate Glass into the classroom experience. Regarding the usage of smartwatches, Parker offered more insight. “With our museum project, we’re working with the watches in that space to deliver content to the students and visitors. Through the delivery of timely and relevant content, along with subtle reminders, the watch represents an attempt to eliminate the distraction of traditional technology and allow visitor to focus on the artwork.” Parker illustrated an example of this: the scavenger hunt. Visitors are invited to locate pieces in the galleries based on snippets of the art and simple clues. “By incorporating indoor location technology, we can deliver ‘hot and cold’ notifications to the watch as the visitor navigates through the museum,” he said. 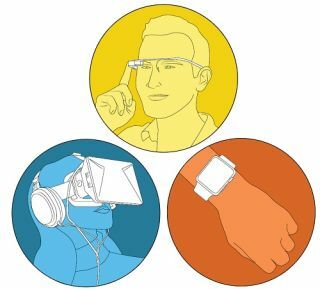 Wearables as a category provide countless possibilities for pedagogical tools, app development, and more. Such technologies aid in not only bringing greater market visibility, but also in providing a strategic pathway toward the broader advancements to come. For early adopters & the uninitiated, these reports will inspire you to learn more about what’s possible in emerging technology.